We previously identified and characterized a novel 55 kDa nuclear protein, termed nmt55/p54nrb, whose expression was decreased in a subset of human breast tumors. The objective of this study was to determine if this reduced expression in human breast tumors was attributed to the regulation of mRNA transcription or the presence of altered forms of this protein. Northern blot analysis and ribonuclease protection assay indicated that nmt55/p54nrb mRNA is expressed at varying levels in estrogen receptor positive (ER+) and estrogen receptor negative (ER-) human breast tumors suggesting that reduced expression of nmt55/p54nrb protein in ER- tumors was not due to transcriptional regulation. To determine if multiple protein isoforms are expressed in breast cancer, we utilized Western blot and immunohistochemical analyses, which revealed the expression of an nmt55/p54nrb protein isoform in a subset of ER+ tumors. This subset of ER+ human breast tumors expressed an altered form of nmt55/p54nrb that was undetectable with an amino-terminal specific antibody suggesting that this isoform contains alterations or modifications within the amino terminal domain. Our study indicates that nmt55/p54nrb protein is post-transcriptionally regulated in human breast tumors leading to reduced expression in ER- tumors and the expression of an amino terminal altered isoform in a subset of ER+ tumors. The potential involvement of nmt55/p54nrb in RNA binding and pre-mRNA splicing may be important for normal cell growth and function; thus, loss or alteration of protein structure may contribute to tumor growth and progression. Human breast tumorigenesis is a multistage process encompassing complex cellular transformation from normalcy to malignancy . It has been proposed that multiple, different cellular events dictate the biochemical changes that allow normal cells to become highly malignant. These key events require alterations in the expression of many genes, translation of RNA transcripts, and cellular activation by growth factors, hormones and proteins in the evolving tumor cell population [1–5]. Steroid hormones play a vital role in the growth of normal mammary gland tissue, as well as, the development and progression of breast tumors. Human estrogen receptor alpha (hERα) is detected in 50–85% of all breast tumors , and is utilized as a prognostic marker to identify patients who may have a favorable response to hormonal or endocrine manipulations. Thus, hERα provides a useful prognostic index in patients with metastatic disease and is associated with disease-free survival [7–10]. However, 35% of all patients with hERα positive (ER+) tumors do not respond to hormonal interventions suggesting cellular and molecular alterations [6, 11, 12]. This lack of response may be attributed, at least in part, to the presence of nonfunctional hERα as determined by the inability of hERα to bind hormone, to recognize and bind to specific DNA-responsive elements and/or its inability to recruit other transcriptional activation factors [6, 11, 12]. It may also be attributed to tumor heterogeneity in which some tumor cells may continue to express functional hERα while other cells may express either dysfunctional hERα or do not express hERα at all. This may permit the tumor to become autonomous with respect to hormone sensitivity, allowing tumor progression. Currently, human breast tumor hERα content is determined by ligand-binding assays or immunohistochemistry. While these techniques measure either hERα content or its cellular distribution, they do not provide the means for assessing hERα functionality. In our search for new tumor markers, we identified and characterized a novel 55 kDa nuclear protein, termed nmt55 . The amino acid sequence of nmt55 was highly homologous, but not identical, to that reported for the nuclear protein p54nrb identified in HeLa cells . A more recent report by Peters et al. noted differences in the sequence of the reported HeLa cell p54nrb and placental p54nrb. When we compared the sequences of nmt55 and placental p54nrb (U. Muller, Personal Communication), we determined that the sequences were identical. The differences in the sequence for nmt55, placental p54nrb and HeLa p54nrb are most likely due to HeLa p54nrb sequencing error. Chromosomal location and sequence identity data confirm that p54nrb has the same sequence as nmt55 and are the same gene. We refer to this protein as nmt55/p54nrb. Our studies on nmt55 and those of p54nrb have characterized this protein as an RNA binding protein with the ability to associate with Topoisomerase I and the polypyrimidine tract-binding protein associated splicing factor (PSF) [16–20]. Further, we observed the association of nmt55/p54nrb with several splicing factors known to be essential for spliceosome formation suggesting a role for nmt55/p54nrb in pre-mRNA splicing (unpublished results). Our previous studies investigated the protein expression of nmt55/p54nrb in human breast tumors using a monoclonal antibody with an epitope localized to the carboxyl terminal domain of this protein. These studies demonstrated a statistically significant association between nmt55/p54nrb protein expression, tumor hormonal phenotype and mean tumor size . Specifically, in tumors large in size or those tumors which were determined to be ER-, the expression of nmt55/p54nrb protein was absent, or greatly reduced . These results suggested that loss of nmt55/p54nrb protein expression may be related to hormone insensitivity, tumor differentiation state, unregulated tumor growth and metastases. The absence or reduced expression of nmt55/p54nrb may be attributed to the regulation of mRNA expression, protein processing of a specific functional domain or the presence of a heterogeneous population of nmt55/p54nrb isoforms which may not be immunodetected by monoclonal antibody NMT-1. In this study, we compared mRNA levels in ER+ and ER- human breast tumors using Northern blot analysis and ribonuclease protection assay to assess if nmt55/p54nrb is regulated at the transcription level. We further developed, nmt55/p54nrb specific, site-directed polyclonal antibodies to the amino terminal region and to a mid-region to assess the potential presence of multiple nmt55/p54nrb isoforms or processed nmt55/p54nrb in human breast tumors. [2,4,6,7-3H] Oestradiol ([3H] E2) (102 Ci/mmol) was obtained from Amersham (Arlington Heights, IL). α-32P CTP (800 Ci/mmol) and γ-32P ATP (3000 Ci/mmol) were obtained from New England Nuclear (Boston, Ma). Unlabeled diethylstilbestrol (DES) was obtained from Steraloids (Wilton, NH). Monoclonal antibodies NMT-1 and EVG F9 were developed to unique peptides encompassing amino acids 140–154 and 140–154–247–263 of hERα, respectively [21–24]. Monoclonal antibody 4.14 was raised against a peptide representing amino acid sequence 533–547 of human progesterone receptor (hPR) . All other chemicals were reagent grade and were obtained from commercial sources. Human breast cancer tissue was obtained from patients undergoing surgery for the treatment of breast cancer, as described previously . The MCF-7 human adenocarcinoma cell line was obtained from the American Type Tissue Culture Collection (Manassas, VA). TEGT Buffer consisted of 50 mM Tris-HCl, 10% [vol/vol] glycerol, 1 mM EDTA, 0.02% [wt/vol] sodium azide and 10 mM monothioglycerol, pH 7.4, at 4°C. TGET/MO buffer was TGET buffer containing 10 mM sodium molybdate. TBST buffer consisted of 50 mM Tris-HCl, 0.15 M NaCl, and 0.5% Tween 20, pH 8.0. Cytosols were prepared as described [22, 27–29]. Briefly, tissue was homogenized (0.5 g/3 ml) in TEGT/MO buffer. The homogenate was centrifuged at 100,000 × g for 30 minutes at 4°C and the supernatant fraction (cytosol) was collected. After the removal of the cytosolic fraction, the nuclear pellet was resuspended in 1.5 ml of TEGT buffer containing 0.4 M KCl and incubated on ice for 1 hour with intermittent vortexing. The solubilized proteins were separated from the insoluble chromatin by centrifugation at 100,000 × g for 30 minutes at 4°C. The supernatant fraction (nuclear extract) was collected and used immediately for experimentation or frozen at -80°C. The concentration of unoccupied hERα was determined by ligand binding analyses as described previously [22, 27–30]. Briefly, cytosols were incubated with 5 nM [3H] E2 in the absence (total binding) or presence (nonspecific binding) of a 1000-fold molar excess of unlabeled DES for 16–20 hours at 4°C. Free radioactivity was then separated from bound radioactivity by dextran-coated charcoal (DCC) pellets. In all experiments, nonspecific binding was determined and subtracted from total binding to obtain specific binding. The binding data were normalized in femtomoles per milligram (fmol/mg) of cytosol proteins. We chose a positive cutoff value of 10 fmol/mg protein for hERα [6, 11–13, 31, 32]. We have previously used sequence specific peptides to generate site-directed monoclonal and polyclonal antibodies [21, 22, 24, 25, 27, 28]. Two peptides, NMT-4 and NMT-5, were synthesized, purified by gel filtration and analyzed by HPLC. Analyses of the amino acid composition correlated well with the primary sequence. The sequences of these peptides is given in Figure 1A. Amino acid sequence and molecular localization of the synthetic oligopeptides used to generate human nmt55/p54nrb polyclonal antibodies. Keyhole limpet hemocyanin (KLH) and bovine serum albumin (BSA) were dissolved in phosphate-buffered saline (PBS) to give a final concentration of 1 mg/ml. Five milligrams of each peptide was then dissolved in 5 ml of the KLH solution or BSA solution. The pH of the mixtures was adjusted to 9.0 with 0.1 M LiOH. Coupling of the peptide to the carrier protein was initiated by drop wise addition of 6.25% glutaraldehyde to achieve a final concentration of 1%. Each mixture was incubated at 4°C for one hour with gentle agitation. Each mixture was then dialyzed extensively against four changes of PBS. Aliquots were taken after dialysis to determine efficiency of coupling and the remaining dialyzed material was stored at -80°C. New Zealand White female rabbits were obtained from Pine Acre Rabbitry (Norton, MA). Prior to immunization, serum was collected from each rabbit by bleeding through the ear artery and this was designated as pre-immune serum. Each animal was immunized by subcutaneous injection at multiple sites along the back with a total of 1 ml of an emulsion made by mixing equal volumes of complete Freund's adjuvant and KLH-conjugated peptide. The final emulsion contained 500 μg/ml of the desired peptide. After 3 weeks, the animals were boosted with the antigen in incomplete Freund's adjuvant. Two weeks after the booster shots the animals were bled, the sera were collected and tested for the presence of anti-peptide antibodies by enzyme-linked immunosorbent assay (ELISA). Total RNA from MCF-7 cells and human breast tumors was prepared as described . Total RNA was electrophoresed on 1% formaldehyde/MOPS agarose gels and transferred onto nylon-reinforced nitrocellulose membranes. Northern blot analysis was carried out using double-stranded DNA probes labeled to a specific activity of 108 – 109 cpm/μg with α-[32P] CTP using T7 DNA polymerase and random primers. Hybridization was carried out at 67°C for 2 hours in Quickhyb solution (Stratagene, La Jolla, CA). Membranes were exposed to Hyperfilm (Amersham, Arlington Heights, IL) for 24 hours at -70°C following low (2X SSC, 0.1% SDS, 25°C) and high (0.2X SSC, 0.1% SDS, 65°C) stringency washes. The probe used for nmt55/p54nrb analysis was a 499 bp SacI/BglII fragment representing the unique carboxyl terminus of nmt55/p54nrb. This probe was utilized to prevent cross-hybridization with other homologous RNA binding proteins. A 545 bp HindIII/Xbal fragment of human glyceraldehyde-3-phosphate dehydrogenase (GAPDH) was utilized as a probe to normalize for RNA loading . Ribonuclease protection assays were performed using the RPA III Ribonuclease Protection Assay Kit from Ambion (Austin, TX) according to the manufacturer's specifications. RNA was isolated and prepared as described above. A 499 bp nmt55/p54nrb fragment was transcribed with T7 RNA polymerase in the presence of α-[32P] CTP and non-radioactive nucleotides to generate an antisense probe (specific activity of 108 – 109 cpm/μg) or SP6 RNA polymerase in the presence of non-labeled nucleotides to generate a sense probe (control). Sample RNA and the antisense probe were mixed and co-precipitated with 0.5 M ammonium acetate. Samples were hybridized for 18 hours in acetate/citrate buffer, pH 6.8, at 45°C. The hybridization product was digested with an RNase A/T1 mixture. Following digestion, RNase was inactivated and hybridized RNA was precipitated according to the manufacturer's instructions. Precipitated samples were resuspended and analyzed by gel electrophoresis on 5% urea-polyacrylamide denaturing gels. Following electrophoresis, gels were dried for 2 hours at 80°C and subjected to autoradiography for 24 hours at -70°C. Century markers were radiolabeled according to the manufacturer's instructions and used as molecular weight markers. Polyacrylamide gel electrophoresis and Western blot analyses were performed as described [13, 23]. Briefly, samples were electrophoresed on 10% resolving sodium dodecyl sulphate-polyacrylamide gels (SDS/PAGE) according to the method of Laemmli . Proteins were then electrotransferred onto nitrocellulose membranes and the membranes were incubated in TBST buffer containing 5% nonfat dry milk for 1 hour to block nonspecific protein binding. Membranes were incubated with primary antibodies, at various dilutions, for 1 hour and then washed three times with TBST, 10 minutes each. Nitrocellulose membranes were then incubated with the appropriate corresponding horseradish peroxidase-conjugated secondary antibody for 1 hour and washed as above. Antibody-protein interactions were detected using enhanced chemiluminescence (ECL) (Pierce, Rockford, IL) and autoradiography. Formalin-fixed, paraffin-embedded blocks of human breast tissue were re-cut at a thickness of 4 μm, and consecutive sections were stained with Gill's hematoxylin and eosin (H&E) . Immunohistochemical assays were performed using a modification of the antigen-retrieval technique based on microwave exposure. Unless stated otherwise, all incubations were at 37°C in a humidity chamber, followed by two PBS plus Triton X-100 (1:500) washes, 2 minutes each. Endogenous peroxidase activity was quenched using a 3% hydrogen peroxide/methanol solution for 30 minutes at 25°C. This was followed by antigen retrieval and subsequent incubation in blocking reagent (1:50 normal horse serum) for 20 minutes. Anti-hERα monoclonal antibody EVG F9 and anti-hPR monoclonal antibody 4.14 were diluted 1:200 and incubated for 30 minutes at 37°C. Anti-nmt55/p54nrb polyclonal antibodies, NMT-4 and NMT-5, were diluted 1:2500 and incubated for 2 hours at 37°C. Non-immune mouse IgG was used as a negative control antibody. Sections were rinsed and incubated with secondary antibody (rabbit anti-mouse IgG, biotinylated or swine anti-rabbit IgG, biotinylated) for 30 minutes followed by a 30 minute incubation in Streptavidin solution, using DAKO's Quick Staining LSAB Kit (DAKO Corp, Carpinteria, CA). To visualize antibody binding, tissue sections were incubated for 10 minutes in 3, 3'-diaminobenzidine (DAB) at 25°C. Sections were then rinsed in distilled water and counterstained for 1 minute in Gill's hematoxylin. Slides were analyzed by standard light microscopy. We have previously shown that nmt55/p54nrb protein was expressed in most ER+/PR+ human breast tumors but was undetectable in ER-/PR- human breast tumors . Since loss of hERα expression is associated with poor prognosis and continued expression of hERα is associated with disease-free survival and correlates well with tumor differentiation state, we wanted to investigate the regulation of nmt55/p54nrb expression. To test the possibility that nmt55/p54nrb may be transcriptionally downregulated in ER- tumors, we analyzed mRNA levels from a series of human breast tumors utilizing Northern blot analyses and ribonuclease protection assays. Figure 2 shows Northern blot analysis of nmt55/p54nrb mRNA expression in 12 human breast tumors. MCF-7 cells (Lane M), used as a control, express an abundant 2.6 kb mRNA transcript for nmt55/p54nrb. nmt55/p54nrb transcripts were detected at varying levels in both ER+ and ER- tumors. mRNA transcript was expressed at high levels (lanes 2, 3, 5, 9, 11 and 12) moderate levels (lanes 2, 7 and 10) or low levels (lanes 1, 4 and 8). The tumor sample in lane 6 was degraded and was not analyzed further. These different nmt55/p54nrb mRNA levels were not due to differential RNA loading, as GAPDH levels were similar in all tumor samples. These results suggest that nmt55/p54nrb mRNA transcripts are expressed at various levels. It also suggested that nmt55/p54nrb protein expression in some breast tumors does not correlate with nmt55/p54nrb mRNA expression. Specifically, the decreased nmt55/p54nrb protein expression observed in ER- human breast tumors may not be attributed to transcriptional regulation of nmt55/p54nrb mRNA since mRNA expression in ER- tumors is not universally decreased. Northern blot analysis of nmt55/p54nrb mRNA expression in MCF-7 cells and ER+/ER- Human Breast tumors. Total RNA (20 μg) was prepared from MCF-7 cells (lane M) and twelve different human breast tumors (lanes 1–12). The RNA was subjected to hybridization with a human nmt55/p54nrb 499 bp SacI/BglII radiolabeled probe (top panel) or a human glyceraldehyde-3-phosphate (GAPDH) 545 bp HindIII/Xbal radiolabeled probe to indicate levels of RNA loading (bottom panel). Estrogen receptor (ER) expression levels were determined by ligand binding assay and are indicated along the top of the figure. To confirm these observations, ribonuclease protection assay was utilized to analyze a set of different human breast tumors. As shown in Figure 3, all human tumor samples expressed nmt55/p54nrb mRNA transcript. nmt55/p54nrb mRNA was not detected in calf uterine tissue. This was expected since the nmt55/p54nrb probe utilized for detection is of human origin and calf uterus tissue expresses a different transcript for nmt55/p54nrb. This prevents high fidelity hybridization between the probe and the mRNA allowing complete mRNA probe digestion. Based on the data presented in Figures 2 and 3, it appears that nmt55/p54nrb mRNA is expressed independent of tumor hormonal status suggesting that nmt55/p54nrb mRNA is not regulated by hERα. These results, together with those reported previously , further suggest that decreased expression of nmt55/p54nrb protein in ER- human breast tumors is likely a post-transcriptional event. Ribonuclease protection assay of nmt55/p54nrb mRNA expression in MCF-7 cells and ER+/ER- Human Breast tumors. Total RNA (20 μg) was prepared from MCF-7 cells (lane M), ten different human breast tumors (lanes 1–10) and calf uterus tissue (lane C). The RNA was subjected to hybridization with a human nmt55/p54nrb 499 bp SacI/BglII radiolabeled probe. The total RNA/radiolabeled probe mixtures were then digested and separated as described in Materials and Methods. Lane P indicates radiolabeled probe alone, which was not subjected to RNase digestion. Lane R represents radiolabeled probe alone that was digested with the RNase mixture. Estrogen receptor (ER) expression levels were determined by ligand binding assay and are indicated along the top of the figure. Estimated molecular weight is indicated in the MW lane. Since there was no apparent nmt55/p54nrb mRNA regulation in ER+ or ER- human breast tumors, it was possible that monoclonal antibody NMT-1 may not detect the presence of potential multiple isoforms of nmt55/p54nrb protein especially in ER- tumors. This necessitated the development of domain specific antibodies. To this end, two peptides were synthesized and purified based on selected sequences in the subdomains of human nmt55/p54nrb (Figure 1A). 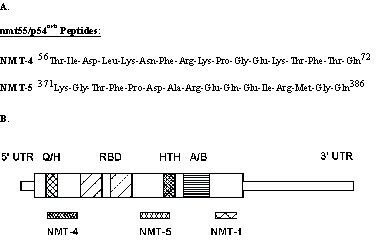 These selected peptides were referred to as NMT-4 and NMT-5 and represent sequences 56–72 and 371–386 of human nmt55/p54nrb, respectively (Figure 1A). Polyclonal antibodies were developed against these peptides; polyclonal antibody NMT-4 recognized a sequence in the amino terminal region of nmt55/p54nrb and polyclonal antibody NMT-5 recognized a sequence in a mid-region of nmt55/p54nrb (Figure 1B). Figure 4 shows the binding of polyclonal antibodies NMT-4 and NMT-5 to a protein with an estimated molecular weight of 55 kDa (lanes 3 and 5 respectively). Pre-immune sera detected no specific protein in the 55 kDa range (lanes 1 and 2). Specificity of the polyclonal antibodies was assessed by pre-incubation with the appropriate immunogenic free peptides. As shown in Figure 4 (lanes 4 and 6), the antigenic peptides competed effectively for the binding of the antibodies to the protein indicating that these antibodies are specific. Complete displacement was not seen in Lane 6 which was due to high titer of the antibody. Incubation of NMT-5 antibody with a higher concentration of free immunogenic NMT-5 peptide resulted in complete displacement (results not shown). These results indicate that the anti-peptide polyclonal antibodies, NMT-4 and NMT-5, detect this 55 kDa protein with high specificity and high affinity. Assessment of NMT-4 and NMT-5 polyclonal antibody specificity for nmt55/p54nrb. 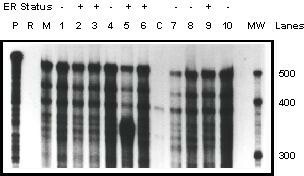 MCF-7 nuclear extract (50 μg) was separated by SDS/PAGE and subjected to Western blot analysis. Lanes 1 and 2 represent immunodetection with NMT-4 pre-immune serum and NMT-5 pre-immune serum, respectively. Lanes 3 and 5 represent immunodetection with polyclonal antibodies NMT-4 and NMT-5, respectively. Lane 4 represents MCF-7 nuclear extract immunoblotted with polyclonal antibody NMT-4 pre-incubated with its corresponding immunogenic peptide. Lane 6 represents MCF-7 nuclear extract immunoblotted with polyclonal antibody NMT-5 pre-incubated with its corresponding immunogenic peptide. Right hand margin represents estimated molecular weight. Since nmt55/p54nrb belongs to a family of RNA binding proteins with conserved domains, it was possible that the polyclonal antibodies NMT-4 and NMT-5 were detecting a protein with a similar molecular weight. To investigate this possibility, we carried out immunoprecipitation assays of MCF-7 nuclear extract with a series of antibodies, and immunoblotted with the same series of antibodies. 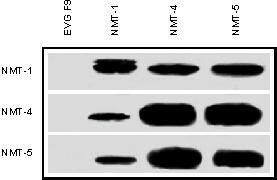 Figure 5 shows MCF-7 nuclear extract immunoprecipitated with monoclonal antibody NMT-1, polyclonal antibody NMT-4, polyclonal antibody NMT-5 or monoclonal antibody EVG F9. The immunoprecipitate samples were then separated by SDS/PAGE and immunoblotted with monoclonal antibody NMT-1 (top panel), polyclonal antibody NMT-4 (middle panel) or polyclonal antibody NMT-5 (bottom panel). 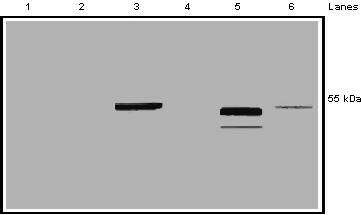 The results show that this 55 kDa protein is detected regardless of which antibody is used for immunoprecipitation or immunoblotting. Since monoclonal antibody NMT-1 is specific for nmt55/p54nrb protein , the results suggest that polyclonal antibodies NMT-4 and NMT-5 are specific to nmt55/p54nrb and do not detect related RNA binding proteins. nmt55/p54nrb protein was not detected in the anti-hERα monoclonal antibody EVG F9 immunoprecipitation sample (negative control). Monoclonal antibody NMT-1 and polyclonal antibodies NMT-4 and NMT-5 also detect bacterially expressed partially purified nmt55/p54nrb protein (results not shown). These results indicate that monoclonal antibody NMT-1 (carboxyl terminal) and the polyclonal antibodies NMT-4 (amino terminal) and NMT-5 (mid-region) detect nmt55/p54nrb protein with high affinity and high specificity. Imimunoprecipitation and immunodetection of nmt55/p54nrb protein with specific site-directed antibodies raised against various domains of nmt55/p54nrb. MCF-7 cell nuclear extracts (50 μg) were subjected to immunoprecipitation assays with the antibodies indicated along the top margin. Lane 1 represents immunoprecipitation with monoclonal antibody EVG F9 (raised against human estrogen receptor alpha), lane 2 monoclonal antibody NMT-1, lane 3 polyclonal antibody NMT-4 and lane 4 polyclonal antibody NMT-5. Immunoprecipitated samples were separated by SDS/PAGE and analyzed by Western blot. Left margin indicates the antibodies used for immunodetection. Top panel represents immunodetection with monoclonal antibody NMT-1, middle panel polyclonal antibody NMT-4 and bottom panel polyclonal antibody NMT-5. Figure 6 shows Western blot analysis of nuclear extracts from 10 human breast tumor immunoblotted with polyclonal antibodies NMT-4 (top panel), NMT-5 (middle panel) and monoclonal antibody NMT-1 (bottom panel). No antibodies detected nmt55/p54nrb protein in ER- human breast tumors (lanes 1–5) confirming previous observations . Monoclonal antibody NMT-1 and polyclonal antibody NMT-5 detect nmt55/p54nrb protein in all ER+ tumor samples (lanes 5–10), albeit at varying levels. Interestingly however, polyclonal antibody NMT- 4 detected nmt55/p54nrb in only 3 out of 5 ER+ tumors. These results have been reproduced in the nuclear extracts of approximately forty human breast tumors suggesting that there is an alteration or modification in the amino terminal domain of nmt55/p54nrb that prevents polyclonal antibody NMT-4 from binding to nmt55/p54nrbprotein. The observations made here further suggest the presence of nmt55/p54nrb variants in a subset of ER+ human breast tumors. Detection of nmt55/p54nrb protein isoforms by Western Blot Analysis using NMT-4, NMT-5 and NMT-1 antibodies. 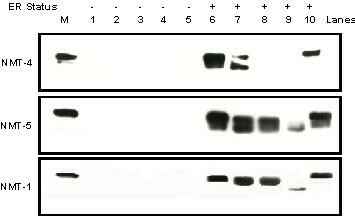 MCF-7 cell nuclear extract (50 μg), lane M, and ten different human breast tumor nuclear extracts (50 μg), lanes 1–10, were separated by SDS/PAGE and subjected to Western blot analysis with polyclonal antibody NMT-4 (Top Panel), polyclonal antibody NMT-5 (Middle Panel) and monoclonal antibody NMT-1 (Bottom Panel). Estrogen receptor (ER) expression levels were determined by ligand binding assay and are indicated along the top of the figure. Detection of nmt55/p54nrb by Western blot analyses requires tumor pulverization, homogenization, fractionation and the preparation of cellular extracts. These manipulations may result in biochemical alterations of nmt55/p54nrb during processing. To insure that this observation was not the result of experimental manipulation, and indeed the nmt55/p54nrb variants detected with polyclonal antibody NMT-5 and monoclonal antibody NMT-1 but not polyclonal antibody NMT-4 were also expressed in intact cells, we utilized immunohistochemical analyses in human breast tumor tissue sections. Further, immunohistochemistry permits the assessment of nmt55/p54nrb subcellular localization and distribution within human breast tumors. Figure 7 shows immunohistochemical analyses of a human breast tumor using hERα, hPR and nmt55/p54nrb specific antibodies. Tissue sections stained positively with monoclonal antibodies EVG F9 (Panel A) and 4.14 (Panel B) showing the expression of hERα and hPR, respectively. Positive staining with polyclonal antibodies NMT-4 (Panel C) and NMT-5 (Panel D) showed the presence of nmt55/p54nrb. Figure 8 represents a tumor which exhibited positive staining for hERα (Panel A), hPR (Panel B), and nmt55/p54nrb when utilizing polyclonal antibody NMT-5 (Panel D). 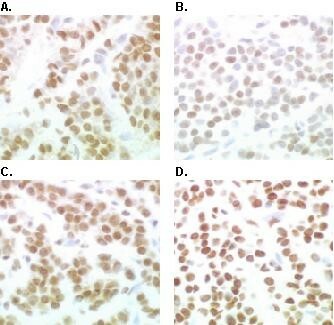 However, this tumor did not stain positive for nmt55/p54nrb when polyclonal antibody NMT-4 was utilized (Panel C). Similar results have been observed in sixteen different human breast tumor tissue sections. The immunohistochemistry data confirm the results obtained by Western blot analyses, suggesting that nmt55/p54nrb protein is expressed in various isoforms in a subset of ER+ human breast tumors. The nature of the alteration or modification in the amino-terminal region of nmt55/p54nrb, which prevents the detection of nmt55/p54nrb by polyclonal antibody NMT-4 by Western blot and immunohistochemical analyses, remains to be determined. 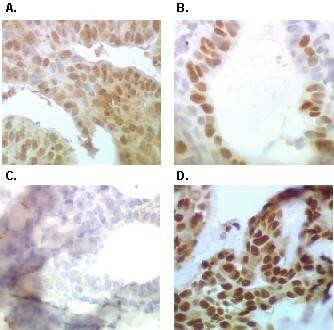 Immunohistochemical Analyses of Estrogen Receptor, Progesterone Receptor and nmt55/p54nrb in a Human Breast Tumor. Human breast tumor tissue was fixed, embedded, sectioned and subjected to immunohistochemical analysis with antibodies to human estrogen receptor alpha (hERα), human progesterone receptor (hPR) and nmt55/p54nrb. Panel A represents immunostaining with monoclonal antibody EVG F9 raised against hERα. Panel B represents immunostaining with monoclonal antibody 4.14 raised against hPR. Panels C and D represent immunostaining with anti-nmt55/p54nrb polyclonal antibodies NMT-4 and NMT-5, respectively. Detection of nmt55/p54nrb protein variants by immunohistochemical analyses with NMT-4 and NMT-5 antibodies in a Human Breast tumor. Human breast tumor tissue was fixed, embedded, sectioned and subjected to immunohistochemical analysis with antibodies to human estrogen receptor alpha (hERα), human progesterone receptor (hPR) and nmt55/p54nrb. Panel A represents immunostaining with monoclonal antibody EVG F9 raised against hERα. Panel B represents immunostaining with monoclonal antibody 4.14 raised against hPR. Panels C and D represent immunostaining with anti-nmt55/p54nrb polyclonal antibodies NMT-4 and NMT-5, respectively. We have previously investigated nmt55/p54nrb protein expression in human breast tumors and observed a statistically significant association between decreased nmt55/p54nrb expression, loss of hERα and hPR and increased tumor size . It is possible that decreased nmt55/p54nrb expression represents poor tumor differentiation, increased tumor growth and metastases since reduced or absent hERα expression and function correlates with poor tumor differentiation [11, 36] and tumor size is a strong indicator of tumor progression . Here we investigated nmt55/p54nrb mRNA expression using Northern blot analyses and ribonuclease protection assays to determine if the reduction of nmt55/p54nrb protein expression was the result of transcriptional regulation. mRNA transcripts for nmt55/p54nrb showed similar expression in human breast tumors and were not related to hERα expression. These results suggest that the regulation of nmt55/p54nrb protein expression observed in human breast tumors is likely a post-transcriptional event. Results from Western blot analyses with polyclonal antibodies NMT-4 and NMT-5 showed that nmt55/p54nrb expression was absent, or greatly reduced, in most of ER- tumors. This confirmed the previous observations obtained with monoclonal antibody NMT-1 . Data also showed that a subset of ER+ tumors expressed nmt55/p54nrb protein detectable with polyclonal antibody NMT-5 and monoclonal antibody NMT-1 but not polyclonal antibody NMT-4. These results suggested the presence of nmt55/p54nrb variants in a subset of ER+ human breast tumors. The inability of polyclonal antibody NMT-4 to detect nmt55/p54nrb in some ER+ tumors may be attributed to proteolysis during nuclear extraction and analyses or biochemical modification of functionally distinct isoform. While the altered molecular weight of the protein sample shown in Figure 6, lane 9 may be attributed to proteolysis, most of the protein samples in Figure 6 displayed a similar estimated molecular weight of 55 kDa. Thus, the lack of nmt55/p54nrb protein detection in this study is most likely not due to proteolysis. We also wanted to determine if nmt55/p54nrb variants detected with polyclonal antibody NMT-5 and monoclonal antibody NMT-1 but not polyclonal antibody NMT-4 using nuclear extracts and Western blot analyses were also detectable in intact cells. To test this premise, we utilized immunohistochemistry to detect nmt55/p54nrb protein in human breast tumor tissue sections. The data from immunohistochemistry confirmed the results obtained by Western blot analyses, which suggested that nmt55/p54nrb protein was expressed in various isoforms in a subset of ER+ human breast tumors. These potential isoforms may have altered biological function due to the loss of domain specific interactions. We have attempted to ascertain the presence and nature of these isoforms by utilizing mixing experiments; however, these experiments have proved inconclusive. The expression and role of this isoform in human breast cancer remains to be determined. A plausible explanation for the lack of nmt55/p54nrb protein detection with polyclonal antibody NMT-4 is a point mutation in the epitope for polyclonal antibody NMT-4, a post-translational modification, such as phosphorylation, in or near this epitope or an alternative splice variant affecting this epitope. Another possibility is the methylation of arginine residues; although this would not alter the overall charge of the protein, it could sterically hinder the protein/antibody interaction. The methylation of arginine residues has been shown to take place in other pre-mRNA splicing proteins though the role of this modification is unknown . One approach to determine the presence of a point mutation or a splice variant is to perform PCR coupled with sequencing techniques. Another approach to resolve this issue is to analyze this protein isoform by Mass Spectroscopy. These studies are currently under investigation. In this report, we show that nmt55/p54nrb protein is expressed in a variant isoform in a subset of ER+ tumors. These data, along with our previous observations, suggest that the association of nmt55/p54nrb and hERα expression represents three separate human breast tumor phenotypes. The first phenotype represents tumors that express wild type nmt55/p54nrb and are ER+. These tumors may be classified as low grade or early stage tumors and respond well to endocrine manipulations. The second phenotype is identified as ER+ using Western blot or immunohistochemical analyses and would express the amino terminal altered/modified nmt55/p54nrb isoform. This may represent mid-grade and mid-stage tumors which are very heterogeneous. It would be of interest to determine if these tumors express nonfunctional hERα and, as a result, do not respond to hormonal therapy. Finally, the third phenotype represents tumors that do not express hERα and nmt55/p54nrb. These tumors would most likely be highly proliferative, classified as high grade and late stage, hormone insensitive and potentially metastatic. While the focus of this study has been the biochemical relationship between nmt55/p54nrb and tumor hormonal status, a more expansive study correlating nmt55/p54nrb protein expression with various breast tumor clinicopathological characteristics may provide additional key information. These studies are under investigation. Our data suggests that nmt55/p54nrb may be critical to cell growth and function, such that, decreased nmt55/p54nrb expression in ER- human breast tumors or the expression of nmt55/p54nrb variants in ER+ tumors may indicate loss of normal growth, nmt55/p54nrb has been shown in several studies to bind RNA and interact with PSF and Topoisomerase I [14, 16–20, 39]. Those results along with our observations that nmt55/p54nrb associates with several splicing factors essential for spliceosome formation (unpublished) and relates to tumor hormonal status  suggest that nmt55/p54nrb may be involved in pre-mRNA processing. Thus, loss of nmt55/p54nrb protein or the expression of nmt55/p54nrb protein variants in tumor cells may result in the loss of hERα expression, the expression of nonfunctional hERα or the altered expression other critical cell growth factors due to lack of proper pre-mRNA splicing. Specifically, the role of nmt55/p54nrb as a splicing factor may affect hERα structure and function. The progression of breast cancer may be associated with changes in RNA processing and the production of aberrantly spliced mRNAs, which may result in non-functional gene products or the loss of specific gene expression. It has been proposed that loss of hERα expression in breast tumors is the result of aberrant RNA processing [40–43]. These aberrantly spliced mRNAs, if translated, could lead to truncated receptors with hormone binding but not DNA binding function . Further, there is evidence for the role of RNA processing in oncogenesis [45, 46]. Many studies, including those on human hnRNP A2/B1 and the CD44 gene, suggest that high fidelity pre-mRNA splicing is critical to normal cellular function and may play a key role in oncogenesis and breast cancer progression [47, 48]. The strong association between nmt55/p54nrb and hERα expression indicates that nmt55/p54nrb may be an important marker for breast cancer progression. The decreased or altered expression of nmt55/p54nrb may be related to tumor differentiation, unregulated tumor cell growth and metastases and may explain tumor heterogeneity, especially with respect to hormonal interventions in the course of treatment. Although an RNA splicing protein, hnRNP A2/B1, has been used as a tumor marker in lung cancer progression , this is the first time that a protein involved in pre-mRNA splicing has been implicated in breast cancer progression and may represent an important breast tumor marker. Further studies are necessary to determine a functional link between this RNA binding protein and hERα in human breast cancer. This work was supported by the U.S. Army Medical Research and Material Command under DAMD 17–98–1–8035.